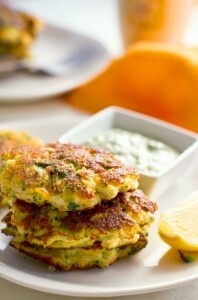 These cauliflower and broccoli fritters are great for breakfast, lunch or dinner. Cauliflower and broccoli provide lots of fibre and vitamins, while eggs and cheese will inject your body with a dose of protein. I am using halloumi cheese which is traditionally made from sheep’s and goat’s milk, however many mainstream manufacturers now also add cow’s milk. Check the label if trying to avoid dairy from cow’s milk. You can go without cheese all together as the eggs and coconut flour should still hold the shape of the fritters. Combine cauliflower, broccoli and halloumi with eggs, coconut flour and black pepper. If not using any halloumi, add a good pinch of salt. Mix well. Whisk aioli ingredients together and serve in a little side ramekin. I hope you enjoy these yummy fritters.